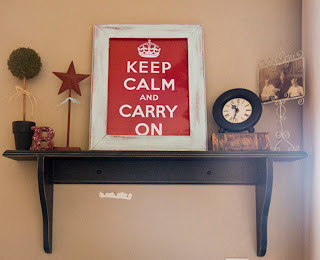 For today's post I wanted to show off a shelf decor display by the very cute Jen. She ordered a couple of shelves from our Poppy Ginger site a little while ago and she was sweet enough to send me a picture of one of them all decorated! I love how it looks!! She bought this 3' Daisy shelf unpainted so her cost was $15. She did a fabulous job with the paint and decor!! Thanks so much Jen!! If you have purchased a shelf from us and would like to send a picture to me I would love it!! Also, let me know if it is ok for me to display the picture on my blogs and in an album. Thanks!! Your shelves are awesome! Im so glad I got some! (and I should have touched up that little spot on my wall before I sent you the pic! oops!) Thanks again Andy!